A concussion is a type of traumatic brain injury. A concussion occurs when a blow or another type of injury causes the head to move back and forth or rotate rapidly. The most common causes of concussions include motor vehicle-related injuries, falls, sports injuries, being struck by or against an object, and assaults. Concussion recovery can take anywhere from a few days to a few weeks or months depending on the severity of the injury, as well as the individual’s age and history of previous concussions. In extreme cases, a concussion may also involve bleeding in or around the brain that may be fatal. 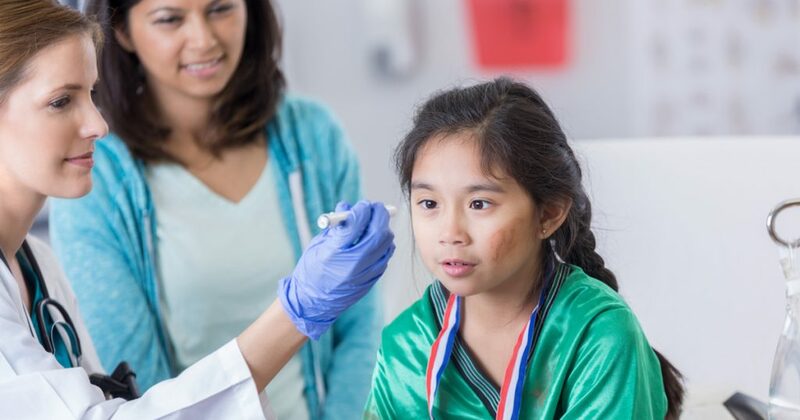 The following are five facts from FastMed that you need to know about concussion symptoms, concussion treatment, and long-term concussion effects. Fast Fact #1: Concussion symptoms fall into four categories. Thinking/Remembering: The individual feel mentally foggy and have difficulty remembering recent events. Physical: The individual may experience sensitivity to light and sound and have a persistent headache. Emotional/Mood: The individual may appear irritable, sad, or nervous. Sleep Disturbance: The individual may sleep more or less than usual. Concussion symptoms in infants and toddlers can be difficult to recognize because they are unable to verbally explain what they are feeling. Nonverbal signs of concussion can include inconsolable crying, becoming easily agitated, lack of interest in favorite activities or toys, loss of new skills, and a lack of balance and coordination. Fast Fact #2: Rest is the primary concussion treatment. Mental and physical rest will allow your brain time to recover from the injury. This includes avoiding activities that involve physical exertion or sudden movements that can worsen symptoms. You should also avoid activities that require intense concentration, such as reading, working on the computer, or playing video games. Depending on the severity of the injury, it may be necessary to reduce hours and workload at work or school and take more frequent breaks. The doctor will let you know when it is safe to resume your normal activities. Fast Fact #3: There are steps that you can take to make concussion recovery faster. Avoid physically demanding activities or any activity that may pose a risk of further injury. Since your judgment and reaction times may be slower, avoid driving, operating heavy equipment, or riding a bike until your provider says it is safe. Do not drink alcohol or take prescription or over-the-counter medications unless approved by your provider. Avoid trying to multitask if you are easily distracted. Avoid flying in airplanes since the pressure changes may worsen your symptoms. Consider talking to teachers or employers about your injury and altering your activities and schedule until you are fully recovered. Fast Fact #4: A concussion test is painless. FastMed Sports Medicine specialists may use a variety of tests to determine if you or your loved one has suffered a concussion. The most basic concussion test involves neurological and cognitive assessments to identify any deficits in vision, balance, coordination, hearing, reflexes, strength, memory, and concentration. This may be followed by imaging tests, such as a CT scan or MRI. Depending on the results of the concussion test, the provider may ask that someone stay with you for 24 hours to monitor your condition or recommend hospitalization overnight for observation. Fast Fact #5: Prompt treatment can minimize concussion long-term effects. To minimize the risk of a concussion, be sure to wear appropriate protective gear when participating in sports or recreational activities, wear your seatbelt when driving or riding in a motor vehicle, exercise regularly to improve strength and balance, and keep your home well lit and free of clutter and trip hazards. FastMed sports medicine providers are able to diagnose and treat a wide range of sports and musculoskeletal injuries including pre-injury baseline concussion testing at all Phoenix-area clinics, and post-injury concussion testing at all Sports Medicine clinics. We are able to perform X-rays, casting, splinting, injections, and other services at our clinics, so there is no need to wait days or weeks for a referral. We are open seven days a week, 365 days a year with extended hours for your convenience. We have more than 100 locations throughout Arizona, Texas, and North Carolina, and you never need an appointment.